As the founder of The Get Real Project, I am the steward of our vision and our service offerings, as well as a workshop leader and keynote speaker. Above all else, I am an entrepreneur on a mission: to kick conventional business wisdom to the curb and transform how people work together as a result. 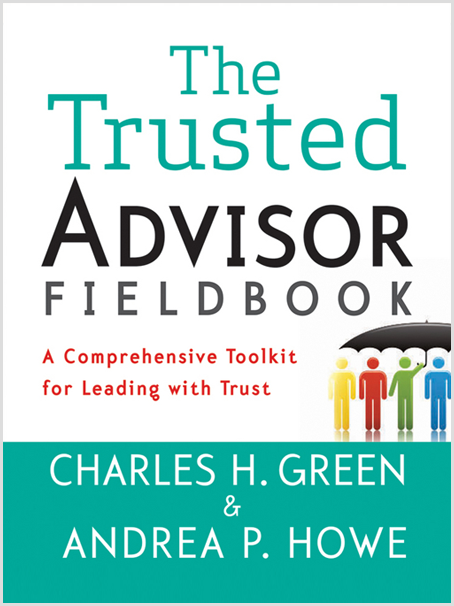 I am also the co-author, with Charles H. Green, of The Trusted Advisor Fieldbook (Wiley, 2012). I am an entrepreneur on a mission: to kick conventional business wisdom to the curb and transform how people work together as a result. I’m a recovering information technology consultant who has spent nearly 25 years managing projects, working with clients, and facilitating groups of all kinds and sizes. My focus for the last decade has been teaching people in consultative roles how to dramatically improve their business performance by getting relationships right. In that role, I have led learning programs and consulted with companies like Accenture, Blackboard, Deloitte, Great-West Life and Price Waterhouse Coopers, among many others. I have a BBA in Computer Information Systems, a MS in Organization Development, and certifications in team building and action learning. When I’m not working, you can find me in my art studio taking far too long to finish my latest mosaic masterpiece, or attending a local dance (swing and salsa are favorites). I’ve got my hands in all of the services we provide, in some way or another, from diagnostics to workshops to follow-on programs. 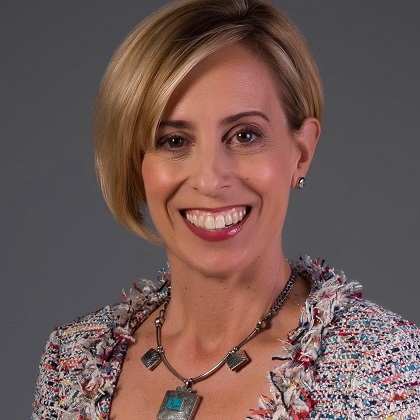 I specialize in leading our immersion workshops and mastery workshops, including three of our signature offerings: Being a Trusted Advisor, Trust-Based Selling, and Trust-Based Consulting. I also train and coach others to lead these programs. And I speak on strategic topics such as customer intimacy, client loyalty, the dynamics of influence, dealing with conflict and developing business with trust. The Trusted Advisor Fieldbook is a practical guide to being a trusted advisor for leaders in any industry. A follow-on to the classic The Trusted Advisor, Charlie and I wrote The Fieldbook with the aim of creating a practical, dog-eared manual that you can keep on your desktop or in your laptop bag as an instant helper. When I was 23 years old I got my first consulting job working for a global information technology firm that within a few years grew to be $1b big. My first assignment was with the United States Navy. After just two weeks on the job, I was asked to join my team on-site for a kickoff meeting at a shipyard in Norfolk, Virginia. There I was, suited up and fully accessorized, in the midst of the dirt and grime of this very industrial locale, surrounded by experienced and grizzled men. The client lead facilitated introductions by going around the table, asking each of us “how long we’d been on the yard” and “what we brought to the party.” I was panicked by the questions as the honest answers were “mere minutes” and “I’m not sure!” I decided to stall for time and positioned myself to answer last. By the time it was my turn to respond, I found out that every single member of the client team had been working in the shipyard longer than I’d been alive. Of course it was obvious to everyone in the room that I was a complete newbie. I skipped the question about how long I’d been on the yard and, for the question about what I brought to the party, regaled them all with as much technical jargon as I could recall from my college curriculum in an attempt to sound qualified to be on the project. What I know now that I wish I knew then: Honesty builds credibility as much as experience does. People who are authentic, creative, and courageous enough to stand out in the crowd. Children and their unbridled way of expressing themselves. Ambivalence. Narrow-mindedness. Crumbs in the butter or mayonnaise. An unconventional path to unconventional results. 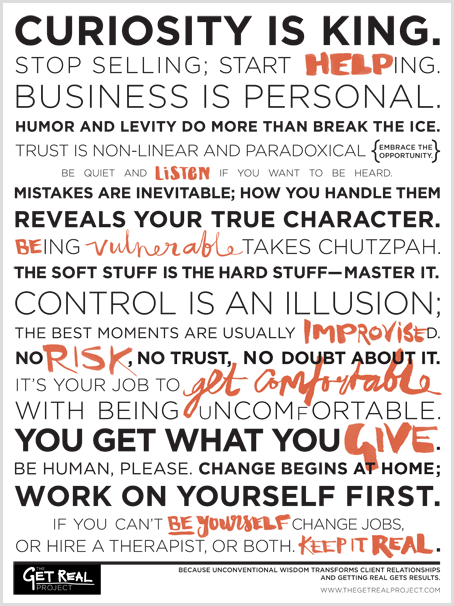 A practical guide for leaders in any industry.